A Harrogate man who made a crust from selling sandwiches for a living has put himself in the picture for a new venture! Nick Allan, who owned and ran Hetty Gray’s on Union Street for the last 12 years, has now turned his back on catering and converted his shop into an art gallery and picture framing business. The move has seen Nick going into business with Darren Schofield and Fiona Kell, who both worked at a framing shop just around the corner on Harrogate’s Oxford Street, and have more than 50-years experience in the trade between them. The former sandwich shop will display and sell a host of original oil paintings, water colours, limited edition prints, wide rang range of picture frames and a variety of decorative objects. The company’s bespoke framing service will also be carried out in-house, which, for certain frames, can be completed within the hour. I’d been running the sandwich business for the last 12 years and I was looking for a new challenge. I’ve always been an art lover and regularly visit galleries around the region, which set my mind thinking. 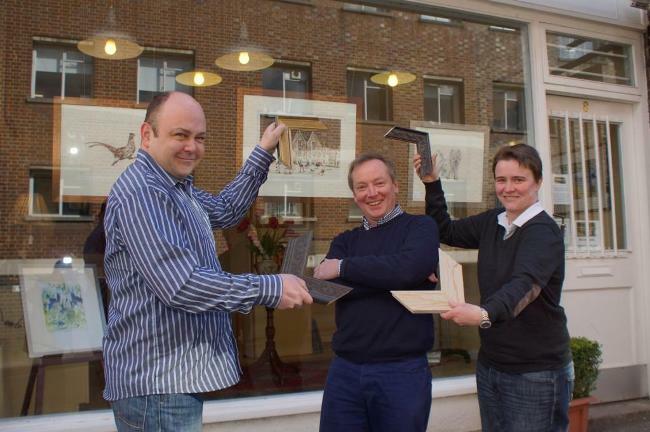 An art gallery and picture framing business would be a great addition to Harrogate town centre. I’ve known Darren and Fiona for a number of years. They were regular customers of mine and we put our heads together and Frames n’ Things was born. We have been open for three weeks now and business is starting to take off as word spreads. I’m really enjoying the challenge and only wish I’d made the change earlier. Frames n’ Things, located at 8 Union Street, and is open Monday – Saturday 9am-5pm.